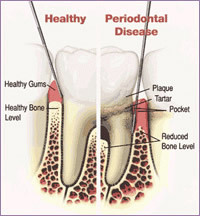 Periodontal disease or gum disease as it is more commonly called affects almost everyone at some time in their lives. The symptoms range from slight bleeding when you brush your teeth, to bone loss and looseness of teeth. Please look through the FAQs below which will answer the questions we are most commonly asked about gum disease. Gingival veneers are a very simple solution to “receeding gums” or if the teeth look too long with dark spaces between them. When gum disease has been present for a long time when it has been treated the gums will often shrink back to be higher up the teeth than they were originally. While the teeth and gums may then be healthy the result can look unsightly. 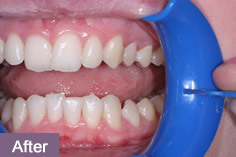 Gingival veneers can provide a simple cost effective answer to this problem. Made typically from a soft silicone they cover the necks of the teeth and can hide all the dark spaces between the teeth. If you do not like to smile because you show large dark spaces then this may be the answer for you, we will always be happy to give you an idea if this is the right solution for you. Gum disease is a bacterial infection that affects the gums and the bone which support our teeth.. Our mouths are full of bacteria, some good and some bad. They are constantly forming in our mouth; this is why brushing more than once a day is so important. Bacteria are constantly forming a sticky film known as plaque on the surfaces of our teeth. If we leave it in place, the bacteria build up and attack the edges of the gums round our teeth. The first stage of gum disease is gingivitis. This is defined as swelling or inflammation of the gum tissue. At this early stage if you look closely at the edges of your gums round the teeth they will look red and shiny. This is due to inflammation of the edge of the gum. Most cases of gingivitis are the result of poor oral hygiene. At this stage the condition is easily treated. At this early stage you would most likely find some bleeding from the gums when they are brushed. A) Early periodontitis– In this stage plaque has been allowed to build up around the gums, and under the edges of the gums. This causes swelling of the edges of the gums and the gum pulls away from the tooth, allowing more harmful bacteria into this “pocket”. B) Moderate Periodontitis At this stage the gum is detaching from the tooth further down the root, and the pockets are difficult to clean with normal methods. The detached gum spreads down beyond the top of the bone which is starting to get eaten away by the bacteria and toxins.This can still be treated non surgically. C) Advanced Periodontitis The gums receed down the tooth –so called long in the tooth appearance. The pockets deepen and fill with pus . The teeth will become loose. You are quite likely to have severe bad breath and blood in your mouth when you eat most firm foods. This stage may need to be treated surgically. All these three stages of gum disease generally are defined as either chronic (been present for a long time) or aggressive gum disease. This is more often seen in younger people and if untreated leads to rapid early tooth loss. 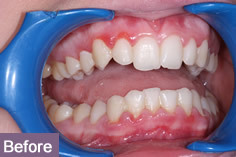 If gum disease is left untreated this can lead to shrinkage of the gums which is what is often referred to as pyorrhoea. As well as being unhealthy it can make the smile very unsightly to look at. Even when the disease treated you can be left with black spaces between the teeth. It is now possible to hide unsightly spaces with acrylic veneers. These are thin silicone or acrylic facings which go over the gum and fill in the spaces. Please see our gallery for an example picture. Gum disease is usually not painful which is why it is often left until too late before treatment is sought. People are often not even aware they have quite advanced gum disease until it is too late. This is why it is so important to see a dentist and hygienist regularly , so your gums can be checked thoroughly and any signs of gum disease can be seen at a very early stage. Does being pregnant give you gum disease? No is the simple answer, and teeth are not lost just because you are going to have a baby, or have had a baby recently. However pregnancy tends to exaggerate the body’s normal response to dental plaque. This is because four basic hormones vital to the pregnancy form in large quantities when you are pregnant. This exaggerates the way the gum tissue reacts to plaque left on the teeth, and can cause what is known as “pregnancy gingivitis”. It is for this reason that we always advise regular and constant monitoring of the gums if you are pregnant. The basic cause is however still poor oral hygiene and plaque on the teeth. I think I have gum disease, can it be treated? Usually the answer is yes it can. The success of treatment and the eventual outcome depends on you. It takes time to treat gum disease, and may involve multiple visits to see one of our hygienists. However seeing a hygienist alone is not the answer, plaque is the cause of gum disease and with the assistance of our hygienists we will show you how to care for your teeth and gums, and ensure that your oral hygiene methods really do remove all the plaque which builds upon your teeth. If you have only gingivitis, you may need no more than a change in the way you brush your teeth. More advanced disease will probably involve having the teeth scaled to remove the hard build up of calculus on the teeth. This may take a few visits. An antibiotic can help if you have a very painful swelling where pus has formed between the teeth, but generally we do not use antibiotics in the treatment of gum disease. We may however recommend localised antibiotic treatments for particular areas of your mouth. For example periochips, elyzol, gengigel, dentomycin. These are not a cure but can help us control an acute phase of gum disease. In almost all cases the answer is yes. Good oral hygiene, use of dental floss or interdental brushes will prevent plaque building up. Regular dental examinations are also vital to ensure any gum disease is found at an early stage. To check if gum disease is present you will often find we gently probe your gums with a special blunt probe to see if their is any bleeding. Are mouth ulcers a sign of gum disease? Almost always the answer is no. No specific cause has ever been found for mouth ulcers, but the good news is that they cannot be caught of other people! There is no cure for mouth ulcers, and they will just heal up on their own normally after 5-7 days. Quite a lot of people have an allergy to sodium lauryl sulphate, which is the foaming agent is a lot of toothpastes. The most important thing with any ulcer is to see your dentist if has not cleared up within two weeks of first noticing it. People tell me I have bad breath , can you help? Halitosis (Bad breath) has more problems than just making you unpopular at parties. It can be a sign of chronic gum disease, dental cavities or more seriously poor digestion, kidney disease or diabetes. However the commonest cause is poor oral hygiene where plaque and debris is allowed to build up between the teeth. Rotting food perhaps with rotting gums create an unmistakable smell. Again the advice is to consult your dentist, as in most cases the problem can be solved. We hope that the above information is helpful, and encourages you to have regular check ups and seek advice if you need it. Modern research has also linked gum disease with an increased risk of heart disease , and more recently with low birth weight babies.